What is Frangipane? It depends on who you ask. Divisive semantics aside, there's consensus on several key details. First, it is a sweet, Almond-flavored filling that appears in pastries ranging from Almond Croissants, Conversations, and Gateau Pithivier. Second, it is commonly made with Almond Meal, Sugar, Eggs and Butter. Third, it is delicious and dangerously addictive. Now for the disagreement. Some pastry chefs consider Almond Cream (Crème D'Amandes) and Frangipane to be interchangeable. But Almond Cream is a thicker filling that bakes to a somewhat dryer, cake-like consistency. To take sides in the debate, Frangipane should be creamier. In fact, Frangipane was originally the name of an Almond-flavored, Custard-filled tart (way back in 1674). It wasn't until many years later that the name was attached to the filling itself. In order to achieve a creamier consistency, modern recipes for Frangipane are effectively a mixture of Almond Cream and Pastry Cream. A 2:1 ratio creates a filling that will bake solid but remain smooth and creamy. It's rarely efficient to make just one Tart at a time. Common Tart components like Pastry Dough (Pâte Brisée or Pâte Sucrée), Almond Cream (Crème D'Amandes) and Pastry Cream (Crème Pâtissière) are much easier to make in larger batches. And these components will keep for several days when stored in an airtight container in the refrigerator. 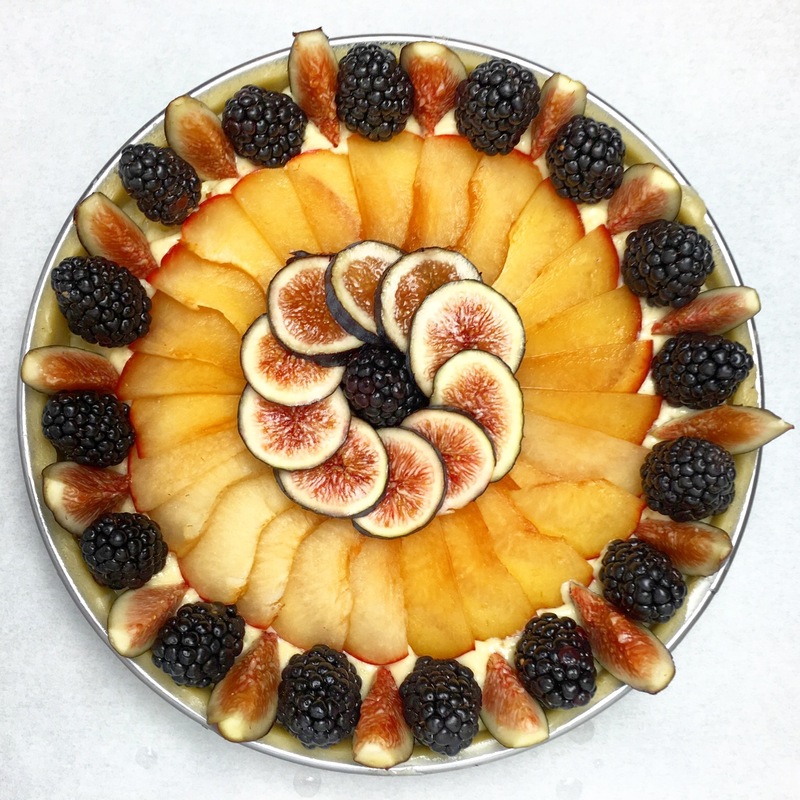 When I made the Seasonal Fruit Frangipane Tart, I had enough of each component left over to make a Fresh Fruit Tart as well. When it comes to the Tart Shell for the Seasonal Fruit Frangipane Tart, you can use either Pâte Brisée or Pâte Sucrée - the choice is yours. It all depends on whether you want to go flakey or sweet. Regardless of your choice, it's best to make the Pastry Dough in advance. The Pastry Dough should be allowed to rest and chill in the refrigerator for at least an hour after it is mixed. Resting the Pastry Dough relaxes any gluten that may have started to form during the mixing process. The end result is a more tender Tart Shell. Allowing the Pastry Dough to rest will also prevent it from shrinking when it bakes. Once it has rested, roll out the Pastry Dough and mold the Tart Shell. Return the molded Tart Shell to the refrigerator to chill and rest for at least 30 minutes. 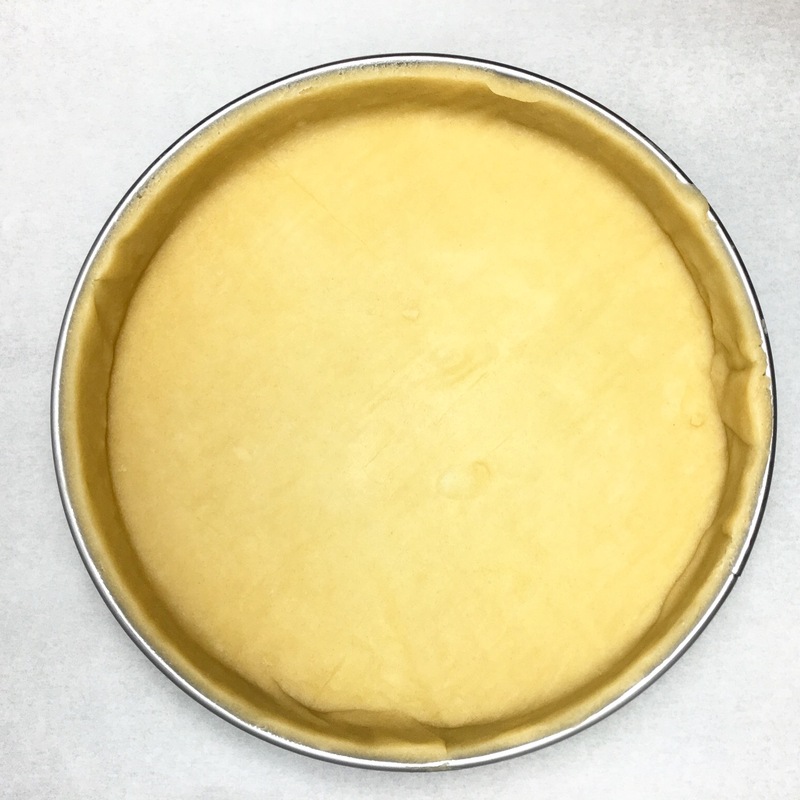 The Tart Shell can even be molded a couple days in advance and stored in the refrigerator in plastic wrap. Frangipane, the primary filling for this Tart, is a fancy name for a relatively simple component. It's nothing more than Almond Cream (Crème D'Amandes) mixed with Pastry Cream (Crème Pâtissière). Both the Almond Cream and the Pastry Cream can be made up to two days in advance. For a single 8"/9" Frangipane Tart, you will need 300g (~1.5 Cups) of Almond Cream and 150g (~0.75 Cup) of Pastry Cream. Both of those amounts are less than one half recipe. However, I do not recommend making less than one half recipe of either component. Preparing smaller batches can be very difficult. In particular, Pastry Cream can easily burn when made in small quantities. Prepare the Pastry Cream and the Almond Cream. If you are making the components in advance, store them in airtight containers in the refrigerator. Place a piece of plastic wrap directly on the surface of the Pastry Cream to prevent a skin from forming. Prepare the Frangipane by first beating the Almond Cream smooth in the bowl of an electric mixer fitted with a paddle attachment. In a separate mixing bowl, whisk the Pastry Cream until it is also smooth. Add the smooth Pastry Cream to the Almond Cream and beat the mixture until it is smooth and homogeneous. When selecting the Fruit for the Frangipane Tart, keep several things in mind. First, the best Fruit will always be what is in season. Peaches in December? Probably not a great idea. Second, as this is a baked Tart (the Almond Cream contains raw Eggs and must always be baked), certain Fruit will fare better than others. Firm-fleshed Fruit, particularly Stone Fruit such as Peaches and Plums, work best because they can withstand the heat and the baking time. Other Fruit, particularly Berries, may become overly soft and completely lose their form by the time the Tart has finished baking. Third, keep in mind that Frangipane is very sweet. 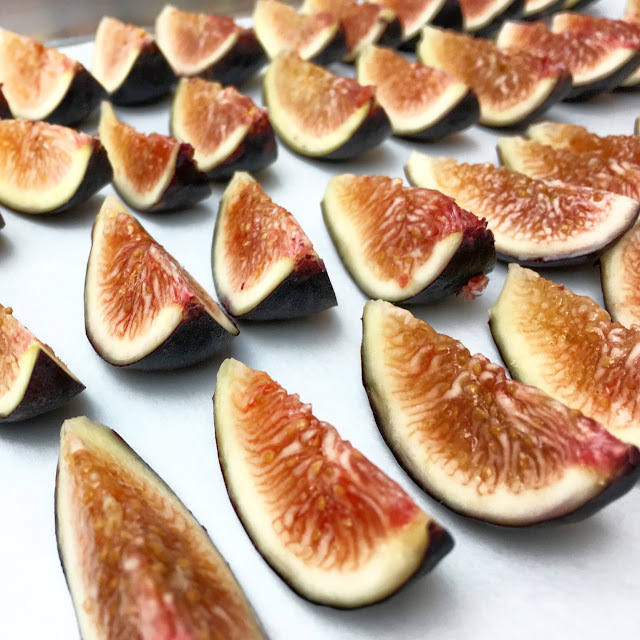 Fruit with some tartness or acidity can help balance the overall flavor profile. Regardless of what you select, wash, dry and cut the Fruit before you start assembling the Tart. 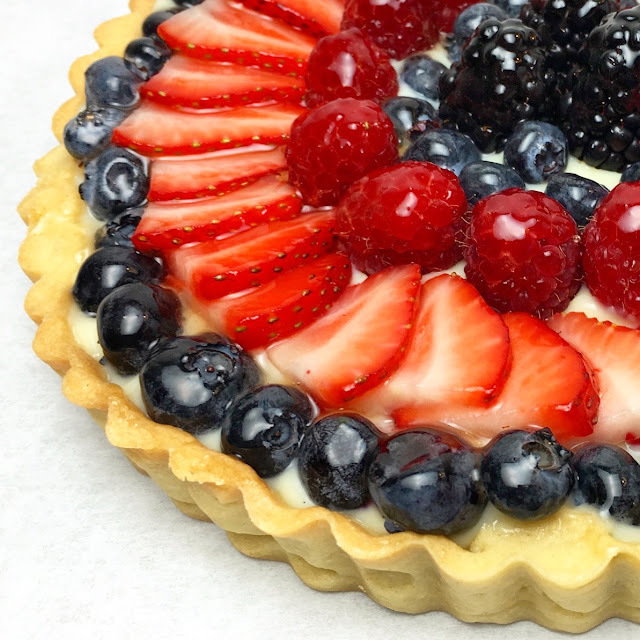 There's nothing more frustrating than running out of Fruit as you're assembling a Tart. Cut the Fruit into pieces that can easily be arranged in a decorative pattern on top of the Frangipane Tart and which will be easy to separate when the Frangipane Tart is cut into slices. All of the hard work is done. Assembling the Seasonal Fruit Frangipane Tart is comparatively quick and easy - and it's the fun part! Assembling the Tart will probably take as long as it will for your oven to come to temperature, so now is the perfect time to preheat the oven to 350 degrees Fahrenheit (177 degrees Celsius). Remove the molded Tart Shell from the refrigerator. Place a smooth layer of Frangipane at the bottom of the Tart Shell. Fill the Tart Shell no more than 2/3 full (you may not need all of the Frangipane). The Frangipane will rise during baking, and there needs to be room for the Fruit on top of the layer of Frangipane. 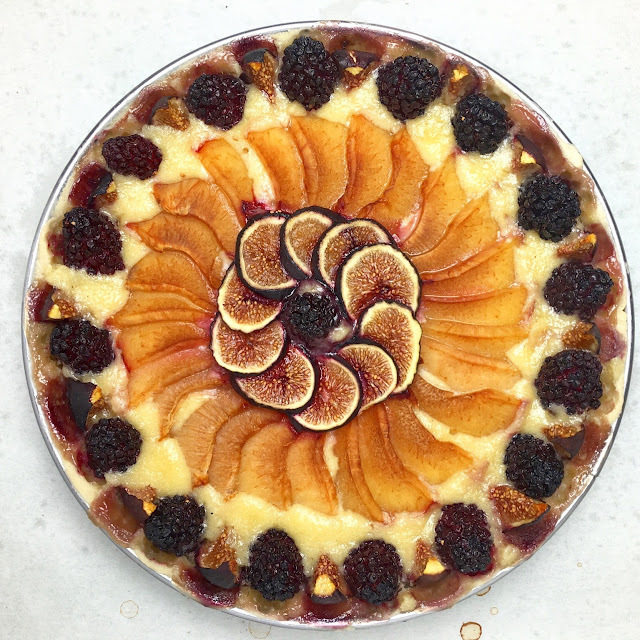 Cover the layer of Frangipane with the pieces of Fruit in a decorative pattern. Place the Fruit in such a way that each slice of the Frangipane Tart will have an even distribution of the Fruit. As you arrange the pieces of Fruit on top of the Frangipane, cover as much of the Frangipane as possible. The Frangipane will rise in the oven. Covering the Frangipane with Fruit helps to contain the rise. It also creates a more visually appealing final product. The final baking time will vary based on the type and amount of Fruit that is used. The Seasonal Fruit Frangipane Tart is done when the Tart Shell is golden brown in color and when the Tart Shell is dry on the bottom. When tapped, the Frangipane should be fully set and should not jiggle. As there is raw Egg in the Almond Cream, it is important for the Frangipane to be cooked through completely. If the edges of the Tart Shell start to brown before the Frangipane is ready, cover the edges of the Tart Shell with foil. 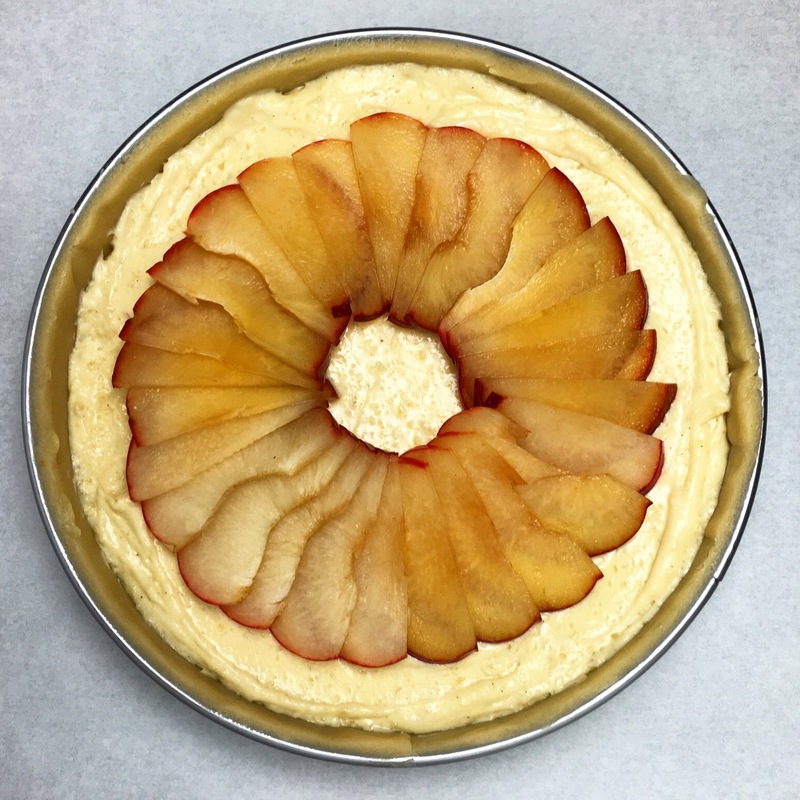 When the Frangipane is fully set, remove the Seasonal Fruit Frangipane Tart from the oven and let it cool to room temperature before removing it from the mold. The Seasonal Fruit Frangipane Tart is best served on the day it is made, but it will keep for 2-3 days when stored in an airtight container in the refrigerator. It can be served chilled, at room temperature or gently warmed. 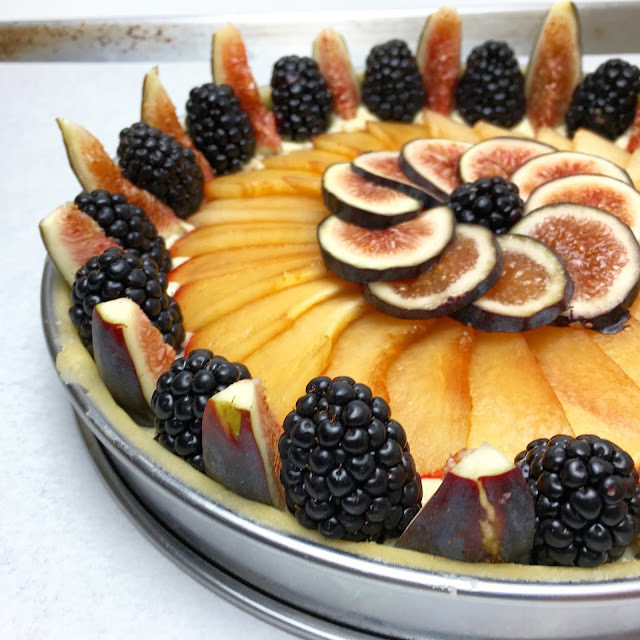 As with many desserts, the individual components for this Season Fruit Frangipane Tart can be prepared a couple of days in advance and then assembled when you are ready. Seasonal Fruit*: e.g. Figs, Plums, Peaches, etc. The recipe links provided are to previous posts containing additional details on the specific techniques involved. *Note on Ingredients: The best Fruit for the Frangipane Tart will depend on what is in season. For any baked Tart, firm-fleshed Fruit and Stone Fruit work best. Berries can be used, but they are more likely to become soft and lose their form as the Tart bakes. The amount of Fruit required will vary based on the type of Fruit used and how it is cut. 1. Prepare the Pastry Dough (Pate Brisee or Pate Sucree) in advance and allow it to rest and chill for at least one hour in the refrigerator. Chef's Note: Resting the Pastry Dough relaxes any gluten that may have started to form during the mixing process. The end product is a more tender Tart Shell. 2. Prepare the Pastry Cream (one half recipe). Allow the Pastry Cream to cool completely with a piece of plastic wrap placed directly on the surface to prevent a skin from forming. 3. Prepare the Almond Cream (one half recipe). Chef's Note: The Pastry Cream and Almond Cream can both be prepared up to two days in advance and stored in the refrigerator. For a single 8"/9" Frangipane Tart, you will need less than a half recipe of each component. However, preparing smaller batches is difficult and is not recommended. 4. Once it is rested, roll out the Pastry Dough and mold the Tart Shell. Return the molded Tart Shell to the refrigerator to chill and rest for at least 30 minutes. 5. Prepare the Frangipane: In the bowl of an electric mixer fitter with a paddle attachment, beat the Almond Cream until it is soft and smooth. In a separate mixing bowl, whisk the Pastry Cream until it is also smooth. Add the smooth Pastry Cream to the Almond Cream and beat the mixture until it is smooth and homogeneous. 6. Prepare the Fruit: Wash and dry the Fruit. 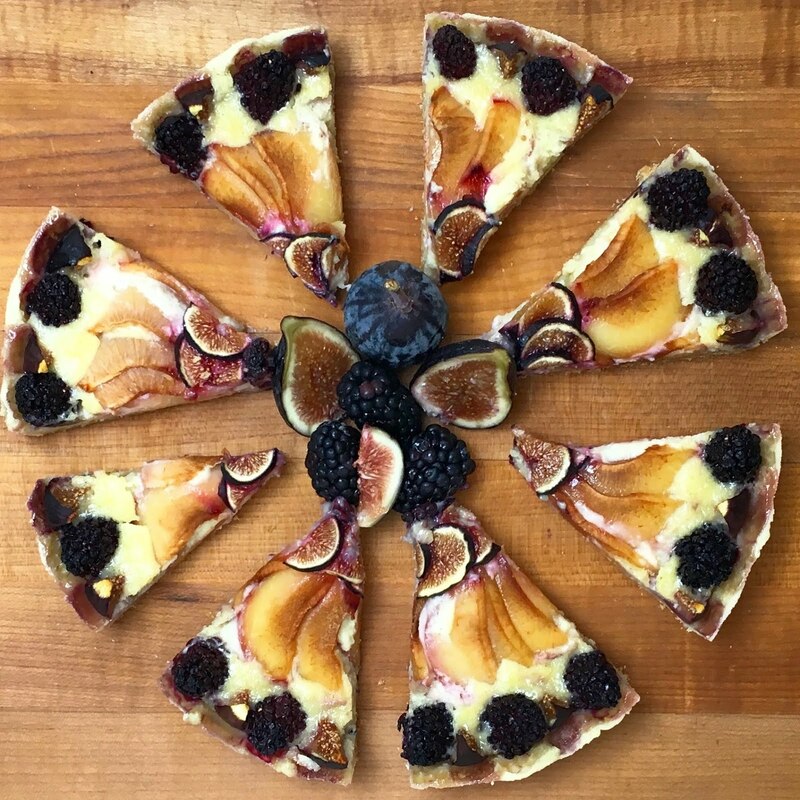 Cut the Fruit into pieces that can easily be arranged in a decorative pattern on top of the Frangipane Tart and which will be easy to separate when the Frangipane Tart is cut into slices. Chef's Note: Cutting all of the Fruit in advance of assembling the Frangipane Tart is important. It is frustrating to have to cut additional Fruit while you are working. 7. When you are ready to assemble the Tart, preheat the oven to 350 degrees Fahrenheit (177 degrees Celsius). 8. Remove the molded Tart Shell from the refrigerator. Place a smooth layer of Frangipane at the bottom of the Tart Shell. Fill the Tart Shell no more than 2/3 full (you may not need all of the Frangipane). The Frangipane will rise during baking, and there needs to be room for the Fruit on top of the layer of Frangipane. 9. Cover the layer of Frangipane with the Fruit in a decorative pattern. Place the Fruit in such a way that each slice of the Frangipane Tart has an even distribution of the Fruit. Chef's Note: When arranging the Fruit on top of the Frangipane, cover as much of the Frangipane as possible. The Frangipane will rise as the Frangipane Tart bakes. Covering the Frangipane with Fruit helps to contain the Frangipane. It also creates a more visually appealing final Frangipane Tart. 10. Bake the Seasonal Fruit Frangipane Tart for 45-60 minutes. The final baking time will vary based on the type and amount of Fruit that is used. The Seasonal Fruit Frangipane Tart is done when the Tart Shell is golden brown in color and when the Tart Shell is dry on the bottom. When tapped, the Frangipane should be fully set and should not jiggle. 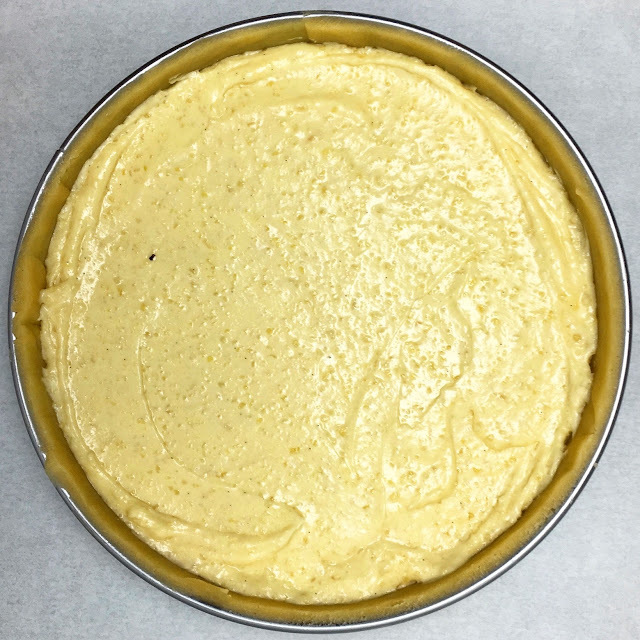 Chef's Note: As there is raw Egg in the Almond Cream, it is important for the Frangipane to be cooked through completely. If the edges of the Tart Shell start to brown before the Frangipane is ready, cover the edges of the Tart Shell with foil. 11. 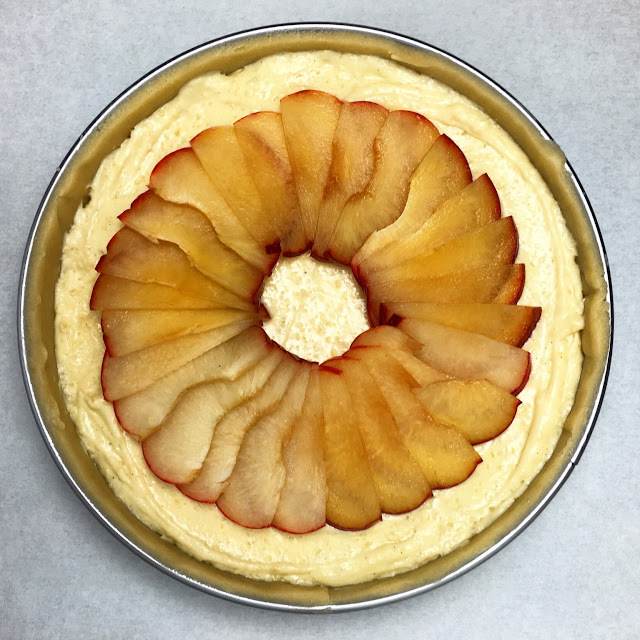 When the Frangipane is fully set, remove the Seasonal Fruit Frangipane Tart from the oven and let it cool to room temperature before removing it from the mold. 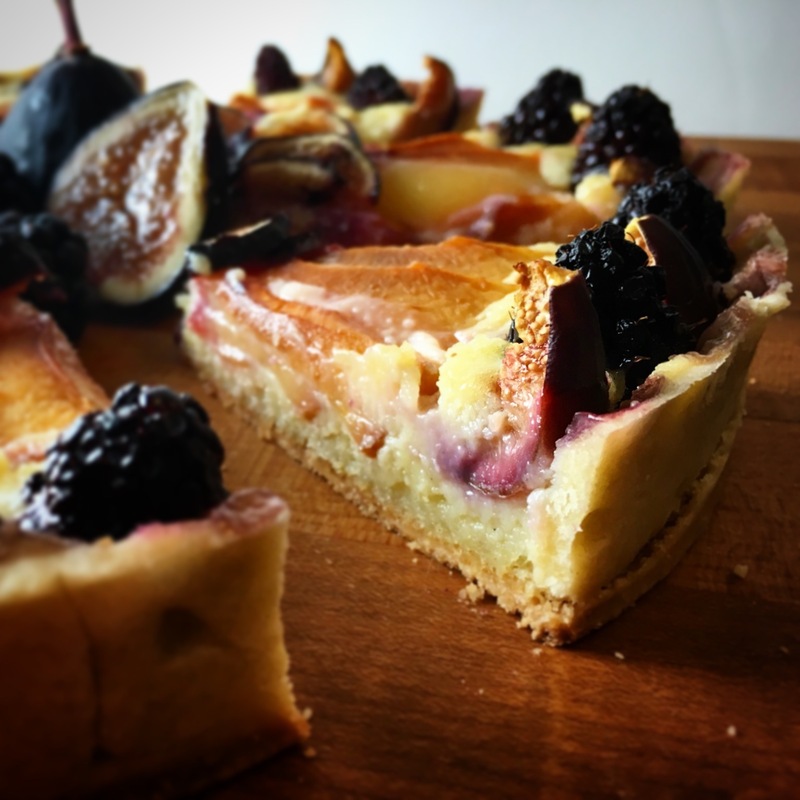 - The Seasonal Fruit Frangipane Tart is best served on the day it is made, but it will keep for 2-3 days when stored in an airtight container in the refrigerator. It can be served chilled, at room temperature or gently warmed. Thanks for sharing this yummy recipe of Seasonal Fruit Frangipane Tart.I will definitely try it out in any party at my place anytime soon.I hope every one would love it.